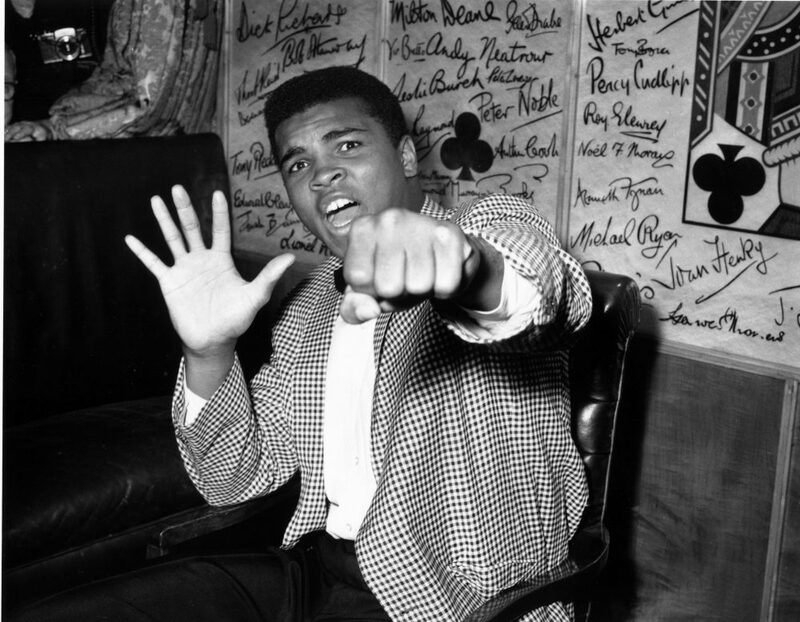 Muhammad Ali, one of the world’s most celebrated sports and civil rights icons, was born on this day in 1942. In celebration with the world on what would have been the heavyweight champion’s 77th birthday, I decided to delve into an untold story: that of a complex man who held many stereotypes about Africa but who through visits and subsequent interactions with Africans, grew to see himself as an African and championed the cause of Black people everywhere. 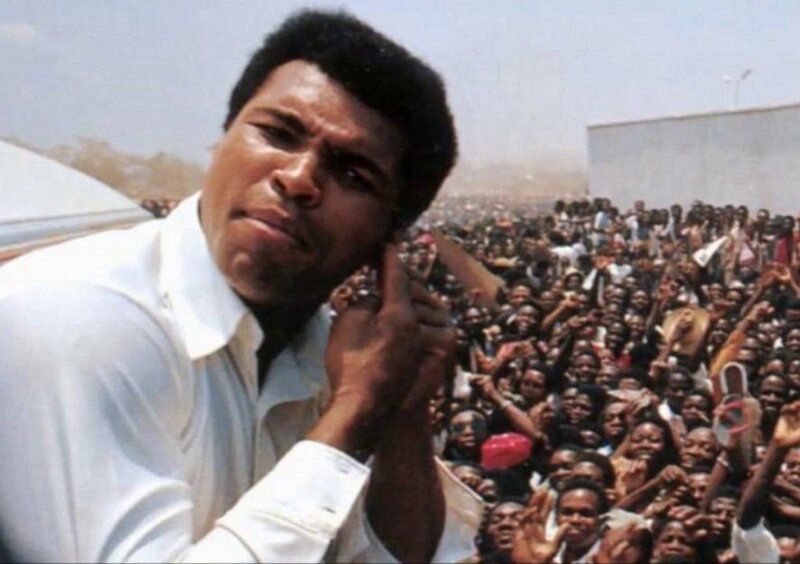 Muhammad Ali, previously known as Cassius Clay, held a lot of ill-informed beliefs about Africa, much of which was symptomatic of the period he lived in. Ali was 11 years old when this feature was published. In 1962, he told sportswriter Myron Cope the following about his encounter with two African men: “Man,” he chuckled, “I was down at the beach with two of them Africans. 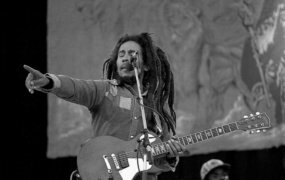 They so black they almost blue, but they said to me, ‘Cassius, we have to leave now and go put on our turbans and uniforms ’cause, if we don’t, people gonna think we’re Negroes”. But after the Olympic Games, Ali had a revelation that would mark the start of his work as a civil rights activist and his conversion to the Nation of Islam. 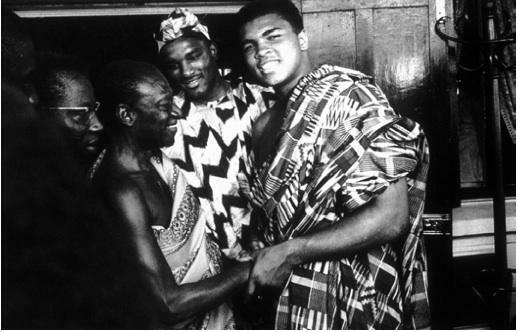 Ali would go on to visit Nigeria, Egypt, Senegal, Algeria, and Morocco on the same trip. A decade later, at age 32, Ali’s legendary fight with George Foreman was held in present-day Democratic Republic of Congo in 1974. The crowd of over 60,000 chanted, Ali Bomaye, in Lingala, meaning “Ali kill him”, solidifying his connection with Africans and putting Africa in the spotlight. 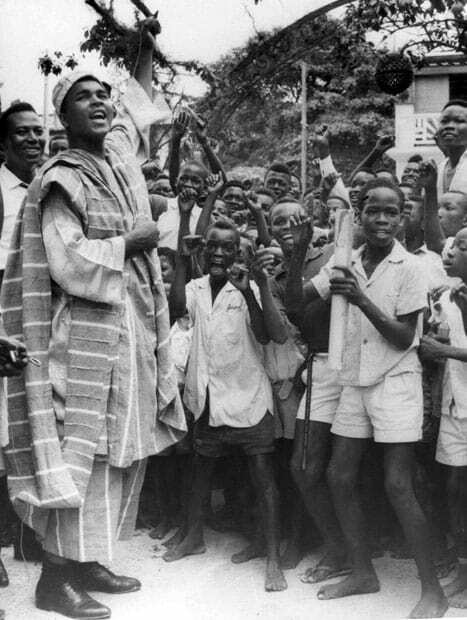 Muhammad Ali, in Nigerian attire, spends some time with elementary school kids. Historian Elliot Gorn explained that Ali came to even greater consciousness however as he grew. He wrote, “Clay later regretted the remark [ about Africans living in huts] when Louisville’s mayor prodded him to repeat it before a delegation at city hall and when a young Nigerian chided him for perpetuating a stereotype of Africa”. Ali maintained a lifelong friendship with African leaders such as Nelson Mandela, with whom he shared many commonalities including the love of boxing. In 1978, he visited the United Nations where he attended a press conference with the UN Special Committee against Apartheid. He visited the Rainbow Nation again in 1993 where he met Nelson Mandela. He continued to work on African causes even after he became ill with Parkinson’s disease. In 1997, he visited Ivory Coast on a goodwill visit to deliver food to 400 orphans in San Pedro.